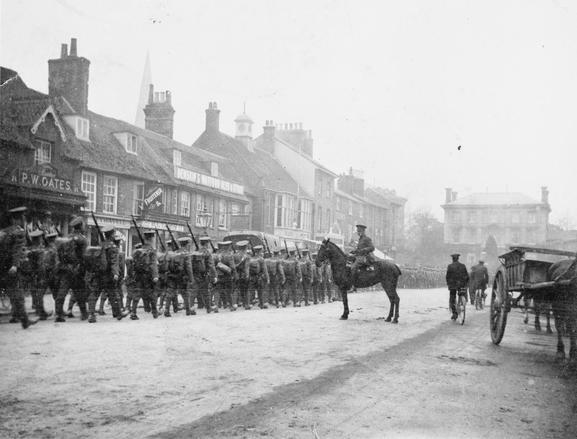 Major John Storer (on horseback) observes the 8th Battalion, Lincolnshire Regiment, marching through Leighton Buzzard, Bedfordshire. Formed in September 1914, the battalion trained in Hertfordshire and Bedfordshire in the winter of 1914-1915, when this photograph was taken. The Battalion landed at Boulogne on 10 September 1915. Major Storer was killed a few weeks later, on 25 September, at the Battle of Loos. His name can be found on the Loos Memorial to the Missing. The inexperienced battalion lost 22 out of its 24 officers at Loos, while 471 other ranks were reported as killed, wounded or missing. Commanding officer lieutenant colonel Harold Walter was among the casualties. This entry was posted in News, Soldiers of the Great War and tagged 1915, Centenary of the First World War, Leighton Buzzard, Lincolnshire Regiment, Loos, Major John Storer, WW1. Bookmark the permalink. Does anyone know who owns this picture, and if there any more of the Regiment in Leighton Buzzard as researching for a book and would like to use pictures in it. My Grandfather John ‘Jack’ Wainwright Sumner (17937) served with the 8th Battalion, Lincolnshire Regiment until 19 December 1919 when he was discharged due to his injuries. He survived the war but suffered from terrible shell shock, He died in 1956. Sorry to hear that story. There must have been so many WW1 veterans with what would now be termed PTSD, but who just had to get on with life as best they could. Agreed. I live in the USA and there is still inadequate healthcare provided for the veterans.